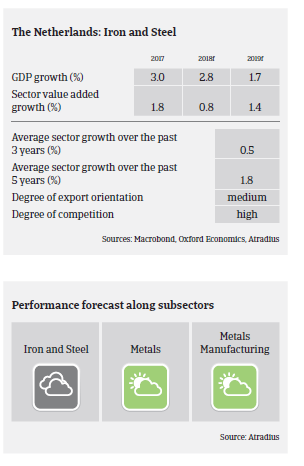 Despite ongoing price pressure the general outlook for the Dutch steel/metals sector is positive, and the impact of the US import tariffs is very limited. Although the steel and metals sector accounts for just 1.1% of Dutch GDP, it is important as a leading supplier for construction, automotive and machinery. The industry is highly dependent on domestic construction sector performance. After some difficult years, the industry has benefitted since late 2015 from a rebound in the domestic building sector, as well as rising demand from automotive and machinery and from increased exports. The overall outlook for 2019 remains positive. As the industry consists mainly of steel traders and wholesalers, the impact of the US import tariffs is very limited. However, due to overcapacity there is on-going price pressure in most segments, which negatively affects margins. However, due to the benign demand situation, profit margins are expected to remain stable in the coming 12 months. Innovation continues to be important in order to focus on efficiency and to reduce costs. Dutch steel makers, traders and wholesalers are higly dependent on banks for financing their stock. Banks have become more willing to lend than in previous years due to the economic rebound. However, any major steel price deterioration in the future would again make it harder to obtain additonal credit facilities. Payments in the Dutch steel and metals sector take 45 days on average. Payment delays and insolvencies are expected to remain stable in the coming months. The insolvency level in this segment is quite low. Our underwriting stance is generally open due to the current positive performance and outlook. We monitor stock levels more closely and low value added steel and metals companies, as they are very sensitive to price fluctuations. Also companies that are highly dependent on the oil and gas and shipbuilding sectors have our special attention due to lower order levels in the past.